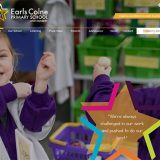 School website news items are an incredibly versatile and useful feature allowing your school to share, celebrate and publicise all of the fantastic things that go on in your school. 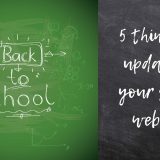 There are a million different ways you can use the school news feature of your CMS but here we have compiled a few suggestions for how to keep parents and website visitors up to date and informed. Highlighting your school’s efforts to raise money is always newsworthy! 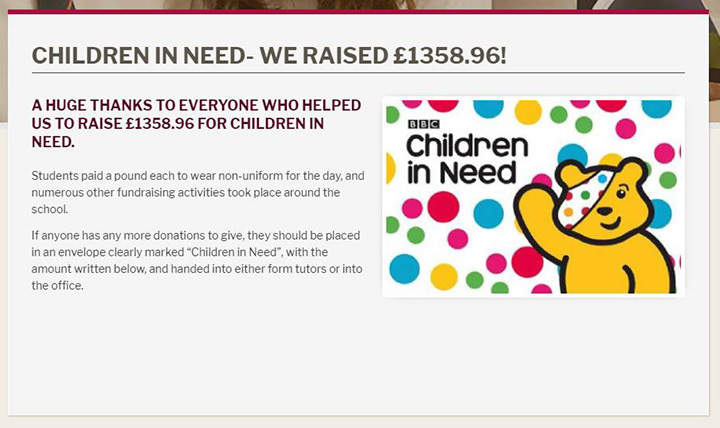 Did a particular year group go the extra mile to raise money for Comic Relief or Children in Need? Did the teachers get in on the fun and dress up for charity? 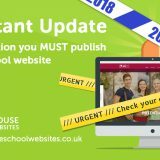 Whilst you may have a dedicated page to exam results and statistics on your website, parents may not realise that this has been updated come exam results day. Making a school website news listing congratulating your students on their results, and posting the statistics for the school is one way to celebrate the hard work of students! 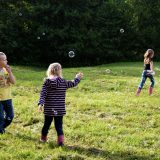 Volunteers help the world go round, but many parents don’t know how to get involved in school activities. Provide all the information they need in a news listing, including a call to action for new volunteers, and you may be surprised how many people respond. Just make sure that they know who to speak to. Student achievements don’t just stop at the school gates. There are plenty of students who are going above and beyond in their spare time too; their actions are a credit to your school and should be celebrated. This applies to ex-students and your teachers too! Have they raised money for charity, completed a marathon, competed in the Olympics, written a book, run for political office, skydived, volunteered their time, starred in a film, or invented something awesome? Big or small, student achievements are definitely worth a news post. Building works can often go on for months, and sometimes large projects extend beyond their original end-date. 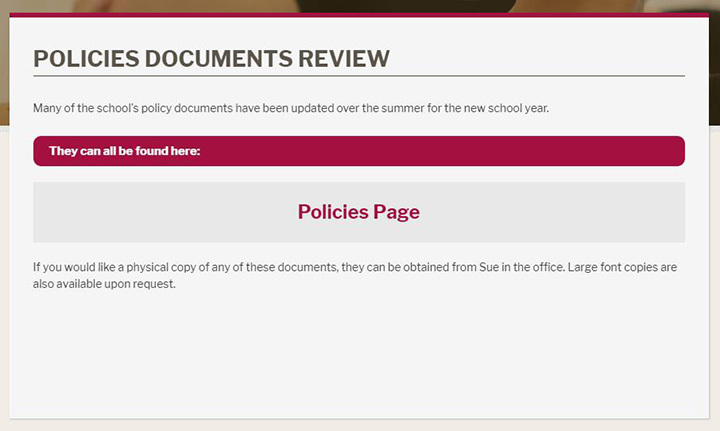 Keeping information about building works up-to-date and easily accessible on the website is useful for staff, students and parents alike. Why not add some photos to keep a photographic record of progress? Have one of your school’s sporting teams done well in recent inter-school tournaments? Perhaps a student smashed school records in Sports Day? Celebrate sporting achievements with a News post; add a picture of the sports team to give them extra recognition! 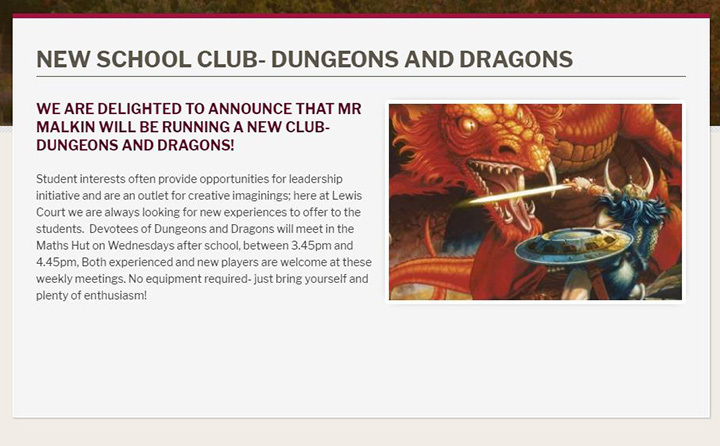 The more you publicise a new school club, the more likely it will be a success. Make sure you say what days and times the club is running, where to meet, and what students need to bring with them (if anything). A celebrity visiting the school is definitely a newsworthy event. You can add a gallery of photos from the day as well so get that selfie stick at the ready! 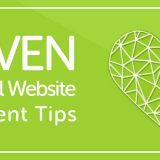 Have you just re-designed your website? Or have you made big changes to the content recently? 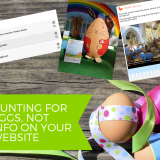 If you have added lots of information that parents will find useful or informative, you could make a News post to draw their attention to it. After all, if they don’t know that it is there, they are far less likely to read it! If you are looking for a fresh look for your website, then get in touch! We’d love to discuss your school’s website needs. 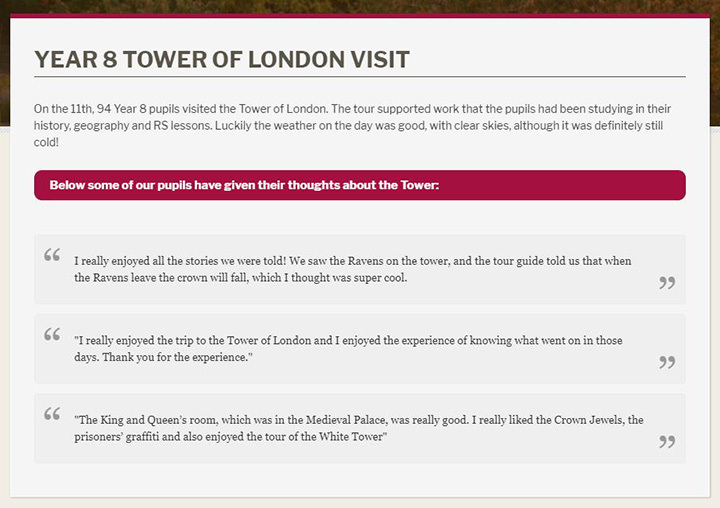 School trips are fun for students and teachers alike. 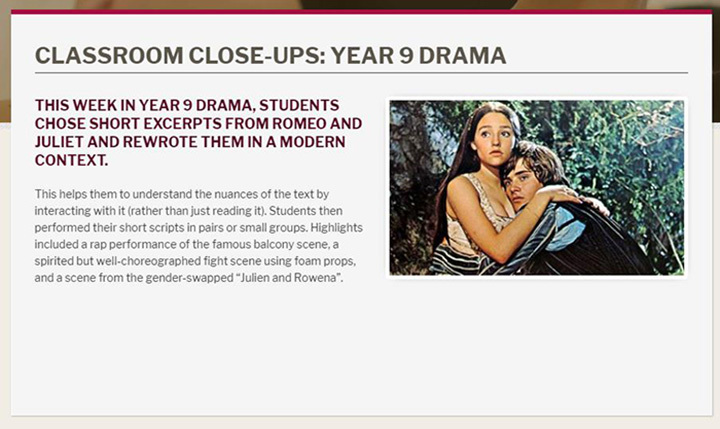 Whether they are a learning experience or just a treat for a year group, they always make a great school news listing. Getting students involved in the running of the school is a great way of teaching a range of practical skills. Summaries of monthly student council meetings, as written by the students, are informative and encourage student participation. 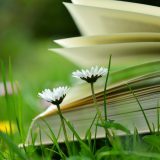 Many parents want more of an insight into what their children are learning and how. If their children are not particularly talkative about what goes on in school, parents may not hear much about what their children are learning about until Parent-Teacher evening. Below is an example of how you can shine a light into an individual lesson. The best way to find the best new staff is to ensure that as many people see the job listing as possible. By highlighting a new vacancy in a school news listing, visitors to the website can share it with their friends and acquaintances, and you could end up hiring someone who had not previously been actively looking for a new job. Make sure you add a link to the applications website, or tell people how they can submit their CV. Making a dedicated post to welcome a new staff member can make them feel like a part of the team before they even start. It is also a great way to publicly thank a departing staff member for their contribution to the school. 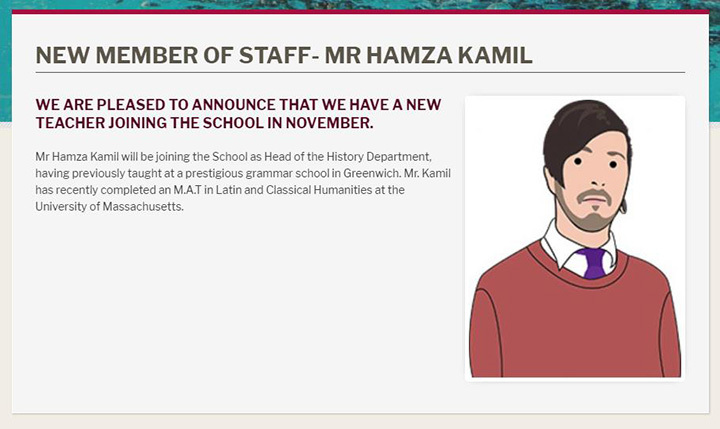 Finally, it’s worth emphasising again that school website news listings are incredibly versatile, and can be as formal or casual as you like. You shouldn’t feel limited to the ideas we have listed here either. 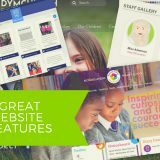 There are many things going on in schools that may feel common place to staff that parents and visitors to the school website would find interesting and informative. 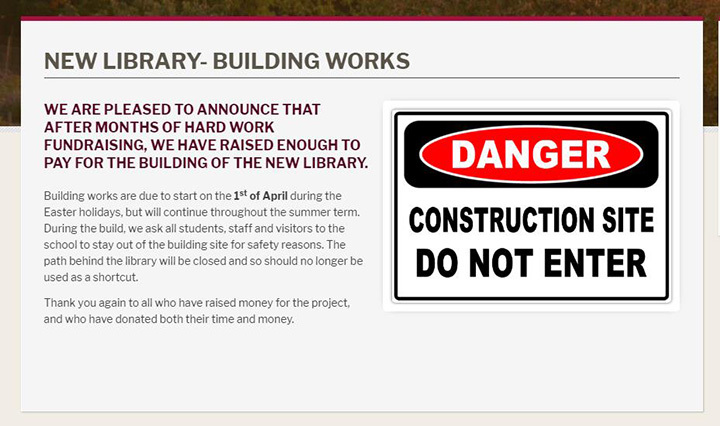 Is your school website news section difficult to use? Click here to book a demo, so you can see just how easy the Greenhouse CMS is to operate. 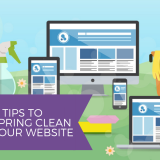 Are you not sure whether you are getting the best out of your Greenhouse website? Please just email Support to book your free refresher training.